Arteries are vessels that carry blood away from the heart. 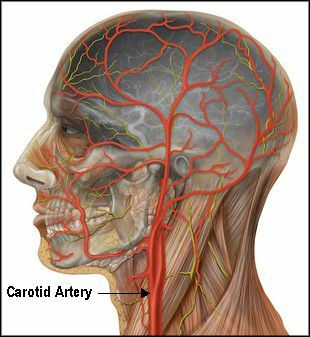 The carotid arteries are blood vessels that supply blood to the head, neck and brain. One carotid artery is position on each side of the neck. The right common carotid artery branches from the brachiocephalic artery and extends up the right side of the neck. The left common carotid artery branches from the aorta and extends up the left side of the neck. Each carotid artery branches into internal and external vessels near the top of the thyroid. The carotid arteries supply oxygenated and nutrient filled blood to the head and neck regions of the body. Internal Carotid Artery - Supplies oxygenated blood to the brain and eyes. External Carotid Artery - Supplies oxygenated blood to the throat, neck glands, tongue, face, mouth, ear, scalp and dura mater of the meninges. Carotid artery disease is a condition in which carotid arteries become narrowed or blocked leading to a decrease in blood flow to the brain. The arteries may become clogged with cholesterol deposits which can break and cause blood clots. The blood clots and deposits can become trapped in smaller blood vessels in the brain, decreasing blood supply to the area. When an area of the brain is deprive of blood, it results in a stroke. Carotid artery blockage is one of the main causes of stroke.